Please note that these are requested dates only. Reservation is not confirmed until date and time are confirmed by staff and party fee is paid. 1. Pentagon MMA will provide tables and chairs for up to 20 child guests, unless additional guests are confirmed and paid for during registration. 2. The party space will be available for a total of 2 hours. The first 30 minutes is set-up time, and the next 90 minutes is party time. 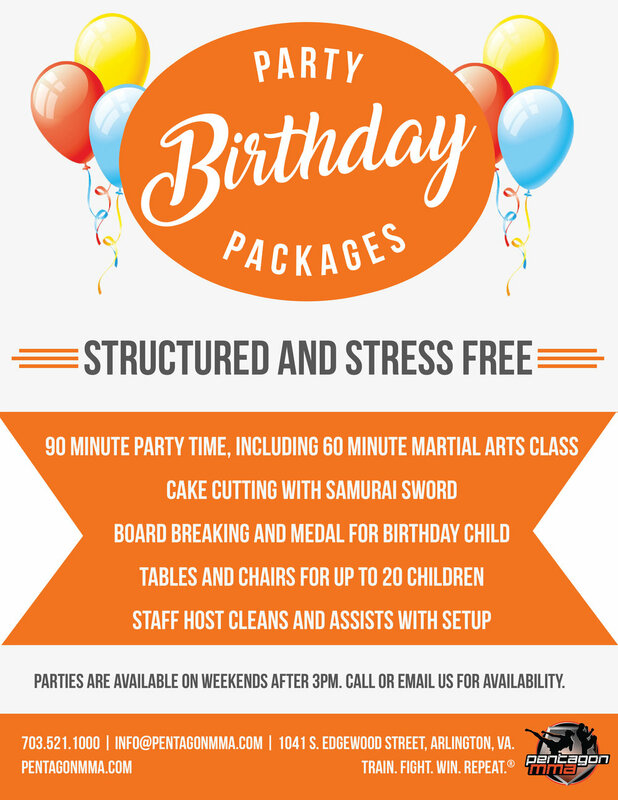 Party time includes a martial arts class of approximately 45-60 minutes, depending on age range of participants. Pentagon MMA staff will take care of cleanup. 3. Please do not use tacks or anything damaging to hang decorations. 4. Party host/parent/guardian is responsible for food, cake, decorations, paperware, utensils, goody bags, and any other party activities planned for birthday child (other than the martial arts class). 5. Pentagon MMA is a non-smoking and alcohol-free facility. 6. Party Fee is due at registration and is non-refundable. 7. All children must be supervised by adults at all times. 7. Candles or fire are not allowed in the facility. 8. I have read and understood all the above points. I also understand that I will be held responsible for any damage to facility and/or equipment made by any guest of party.